The most reliable lighter can arguably be identified as the plasma lighter. It is helpful in bad weather and wind when regular lighters sputter and go out. 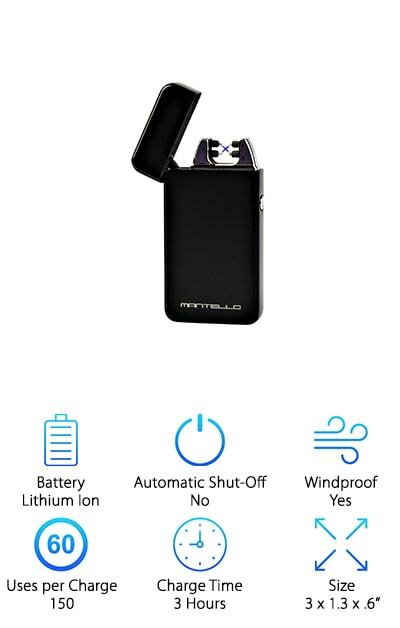 To help you find the best windproof lighter and a lighter that starts up no matter what, we researched a variety of new and best selling products. The result is the top ten plasma lighter reviews below. Now: Before we get started, here’s what you need to know when shopping. Let’s get fired up! Battery: The battery power varies for our top ten plasma lighter picks. The best news is, most are rechargeable. That means no matter what, you’ve got hundreds of uses available to you with your purchase. We identify every battery in use. Automatic Shut-Off: This category is fairly self-explanatory. If you light up a cigarette, and you forget the lighter is still going, some of our plasma lighters will shut themselves off. It’s a safety mechanism, and a handy thing to have around. Windproof: Here is where the plasma lighter really shines. Its “spark” is not dependent on the way the wind is blowing. You don’t need to cup your hand tightly or find a sheltered spot to use it. Windproof lighters are marked. Uses per Charge: Each of the top electric lighters on our list comes with a method for charging up. We will let you know how many times you can turn it on before it has to go back on the cord or the plug. Charge Time: Along with uses per charge, we will also provide the charging time for every single item. Some of the lighters are quicker, while others may take a little longer. All of them, however, are very easy and straightforward to use. Size: We give you the size of each of our best plasma lighters in width, height, and length. This way, you know if it is something you want to keep at home, or in the pocket of your favorite jacket. 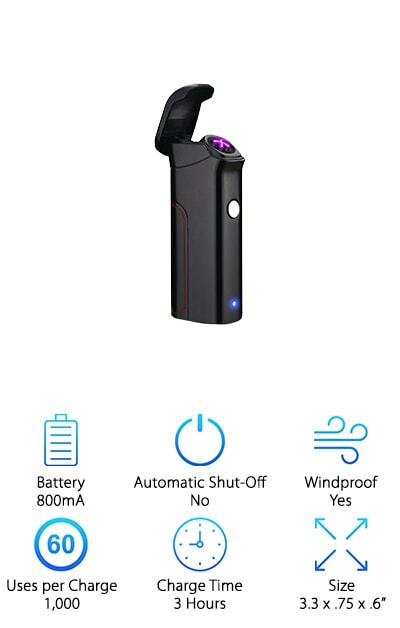 Now that you know how to select the finest plasma lighter, let’s get right to the reviews. Here’s the deal: If you’re in a hurry, take a look at the top pick and the budget pick. Both are fantastic products and are among the best plasma lighters we found. Right below, you’ll find all runner-ups in our lighter reviews. If you’re looking for the best plasma lighter, it is on this list. You are ready: Let’s get started! Our top pick is as stylish as it is useful. It’s even in the name! The Useful Thingy Plasma Lighters are extremely attractive little gadgets. With the press of just a button, a dual-arc plasma flame is created. You don’t get one lighter with purchase, you get two. Keep one in your car, in your purse, or somewhere in case of emergencies. You also get 2 USB charging cables. These four items are tucked neatly into a gift box. If you have a friend who smokes, this is the perfect gift. All you have to do is choose between the two designs. There is bright and shiny gold with two different embossed patterns. There is also deep espresso with an eagle emblazoned on one lighter, and a scorpion on the other. The Useful Thingy Lighters are powered by lithium-ion batteries. They take 2 hours to recharge, and offer up to 300 lights before they must be plugged in again. 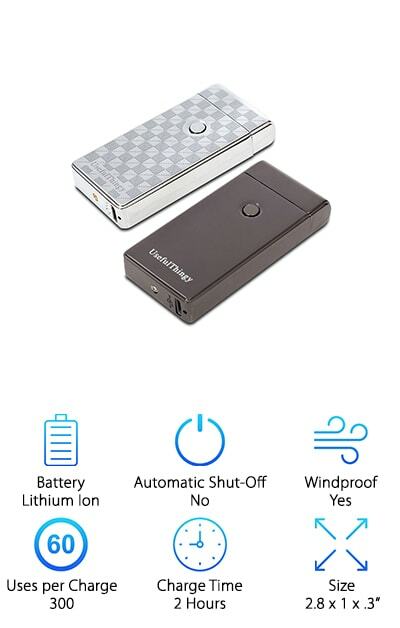 Do you worry that with a plasma lighter, you will not be able to tell when the battery is running low on a charge? Our budget pick is the Mantello Coil Plasma Lighter. It has two little LED lights, one red, and one green. The green one shines when the charge is full, and you can take the lighter off the included USB charging cable. The red one shines when the battery is low, and it needs to be plugged in again. Charging time is 2-3 hours, and you get over 100 lights per charge. The Mantello is powered using a rechargeable lithium-ion battery. Using the same lighter over and over will save you a lot of money in the long run. This lighter also is not any bigger than popular regular lighters like the Zippo. It measures 3 by 1.3 by .6 inches. It will fit snugly into your pocket and takes up very little room. There’s nothing worse than going outside for a smoke and realizing your lighter is dead or broken. 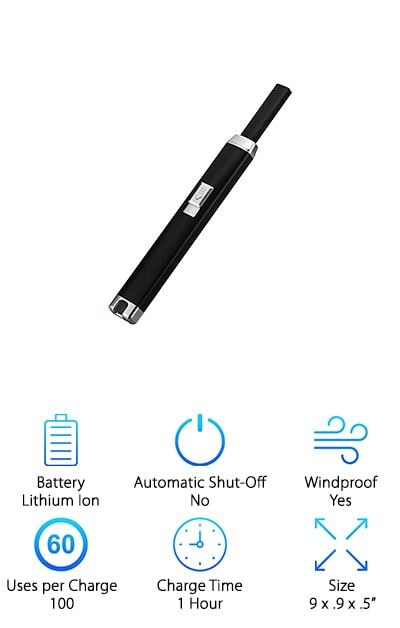 Eliminate that problem for good with the XBULL Plasma Lighter. It has a sharp design, and it works well even on a windy day. 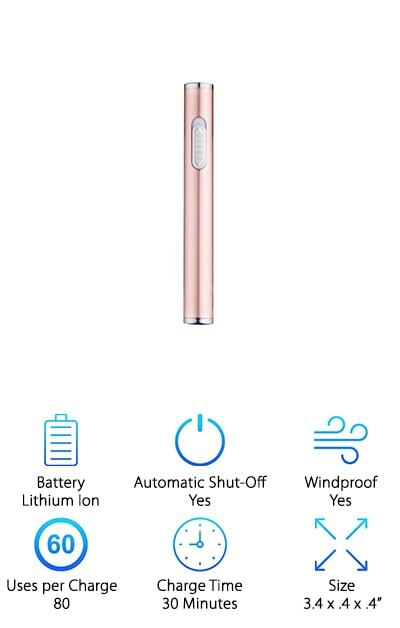 The XBULL charges up in a couple of hours, and then it is ready to provide you with 300 uses before it needs to be plugged in again. It comes with a USB cord for charging, a small cleaning brush, and a fine case. It is an ideal gift because it comes ready to hand over to a friend who likes cigarettes or cigars. 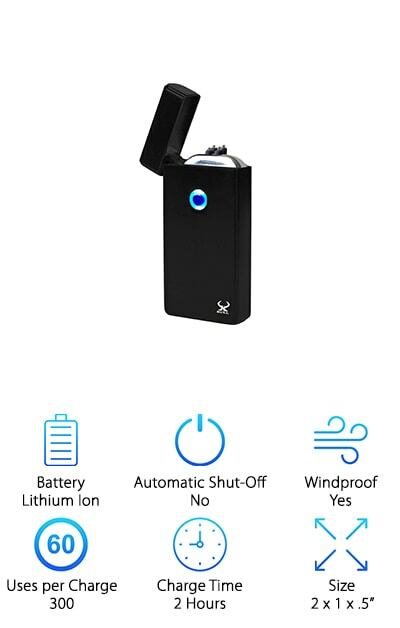 It’s also a smart asset for camping – campfires will be a breeze to light with the XBULL lighter in your pocket. It isn’t made of plastic. Instead, the mold is strong zinc alloy. The spark is solid and thick, with wide arcs for easy lighting. Choose from ice black, jaguar black, or ocean blue. Many of the lighters on our top ten list were created to light a cigarette in seconds. But check this out: The It’s Lit Triple Plasma Lighter can do so much more. It all has to do with its shape. It is 4 inches long, and when you pop open the lid, you discover its triple-arc functionality. Those three arcs meet across a wide, flat surface. You can light so many items safely with this lighter, including cigars, incense, candles, and pipes. It is windproof and splash-proof, so you can angle it as needed. The triple arc also creates a more even and powerful burn. You won't believe how simple it is to use, or how efficient it is. The It's Lit lighter uses a lithium-ion battery that charges quickly and lasts for hundreds of uses. You will be carrying this around for weeks before plugging it back into the micro USB cord. Press just one button to start. A cheap plasma lighter is a great buy because it is not only affordable, it is so much more economical than a regular plastic lighter. When your regular lighter runs out of butane, you have to go and purchase another one, right? Meanwhile, the Q&G Plasma Windproof Lighter keeps going and going. It is one of the smallest lighters on our list, measuring 3.4 by .4 by .4 inches. That’s about the size of a mini cigarillo. In fact, it will fit inside a cigarette box. It also comes in some really nice colors. There is classic black, bright blue, and more, but we love the fashion-forward rose gold. Because it is flameless and windproof, it is safer in your home. It also has an automatic shutoff feature. 10 seconds after it is started and the coil begins to heat, it will turn itself off. You must use the button to start it up again. Charging time is 30 minutes! Plasma lighters for sale are not all painted with the same brush. They vary widely in power and capability, which is why we wanted to share our 10 favorites with you. What a traditional lighter can do, the Saberlight Sparq Plasma Lighter can do better. How? Dual plasma beams shine bright and hot and light up anything from cigarettes and cigars to campfires and candles. It is still slim and elegant, measuring 4 by 1 by 1 inches. Instead of fuel, a lithium-ion battery sits inside and can be recharged with the provided USB cord. 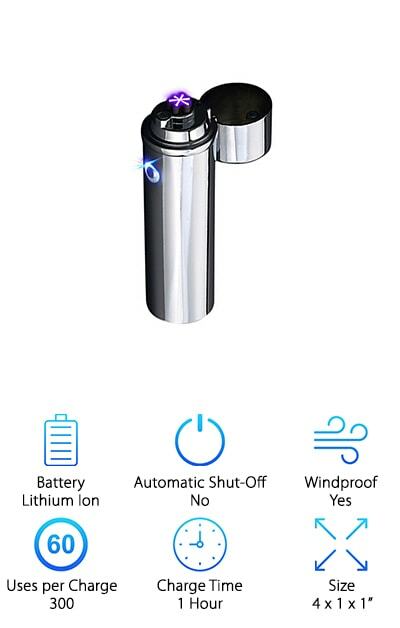 It takes only one hour, and then you have 3 full hours of use or 300 charges available. It's that simple. Whether you don't like butane, you're tired of losing plastic lighters, or you just want something different, add a Sparq to your life. 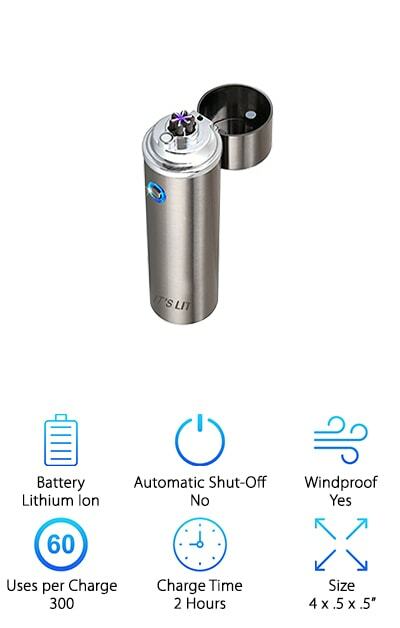 It is windproof and lights with the press of a single button. Every plasma lighter comes with a lifetime guarantee. X marks the spot with the Green King Plasma Lighter. It is a flameless little masterpiece that is sure to impress every one of your friends. Here's how it works: The lithium-ion battery powers a Tesla coil, which in turn sends two arcing sparks across each other. These create the iconic "X" shape. Bring the cigarette toward the spark, and watch as it lights up immediately. This is a much safer alternative to plastic lighters and lighters fueled by butane. This option is also much better for the environment. It comes packaged in a gift box with the necessary USB charging cable. To charge the lighter, plug it in and give it a couple of hours. You will get a charge that lasts an entire week, or about 200 lights. The Green King Plasma Lighter measures 3 by 1.5 by .4 inches. It is compact, and it will go into the pocket of your jacket and remain hidden. Our plasma lighter buying guide would be incomplete without the Alishan Flameless Plastic Lighter. It is a beast. Performance comes first with the Alishan, beginning with its construction. 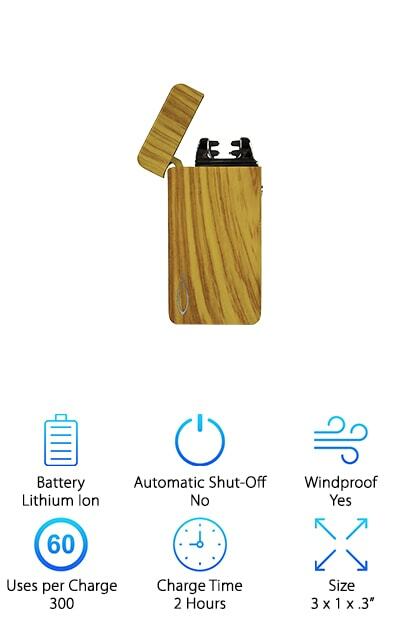 This lighter has a removable 800mA battery that can be charged over and over again. After just a few hours, it will give you an entire month of use. That’s about a thousand sparks, 2-3 times the number of lights provided by other plasma lighters. Measuring 3.3 by .75 by .6 inches, this is light enough to travel with you but it’s also a great addition for your home. The arc lighter forms an “X” shape on a larger flat surface, so you can use this lighter on cigars, pipes, and other bigger objects. Most of what you’re holding for lighting will be lit in under 3 seconds. 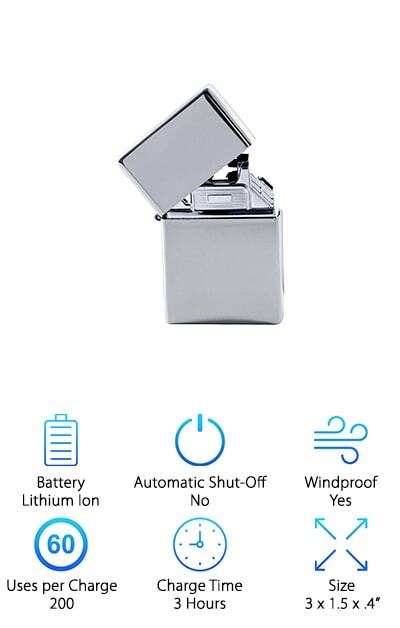 It gets better: This lighter will never ignite while the lid is closed. It is safe to bring on an airplane, too! If metal isn’t your thing, check out the Titan Dual Arc Lighter. The appearance of this lighter is beyond cool. There are three choices: Wooden, with a light wood grain. Multicolored, with an ethereal multi-hued appearance, and camo, in classic green and brown camouflage. You will be the envy of all of your friends, whether or not they smoke. In fact, non-smokers can find a lot of uses for the Titan. Avid campers will love how easy it is to light a campfire or a portable grill. If you keep this lighter in the home, it can be used during emergencies or to light candles for a romantic evening. The Titan Dual Arc Lighter is powered by a lithium-ion battery. It has a built-in safety feature, which only allows the spark if the lid is open. Once it's open, you have about 300 uses before it needs to be recharged, in just 2 hours. A USB cable is provided. Say goodbye forever to disposable butane lighters, taking up space in your car, your home, and landfills everywhere. The Dibikou Pulse Lighter Plasma is slick and stylish. If you have been waiting for the right lighter to come along for your backyard grill, this is it. The gift packaging is also some of the nicest we have ever seen. The Dibikou arrives nestles in black foam, along with a USB cord for charging. The cord has a hook so you can hang it instead of leaving it to just lie around. The lid of the box shows the lighter underneath. It will blow away friends and family when you give this lighter away as a gift. Of course, you need to buy one for yourself first. It is powered by a lithium-ion battery. That's how you get your spark going. It only takes an hour to become fully charged, and then you have about 100 uses ahead of you.